In rheumatoid arthritis (A) the synovial membrane (1) becomes inflames and thickened and produces increased synovial fluid within the joint (2). The capsule and surrounding tissues (3) become inflamed, while joint cartilage is damaged (4). 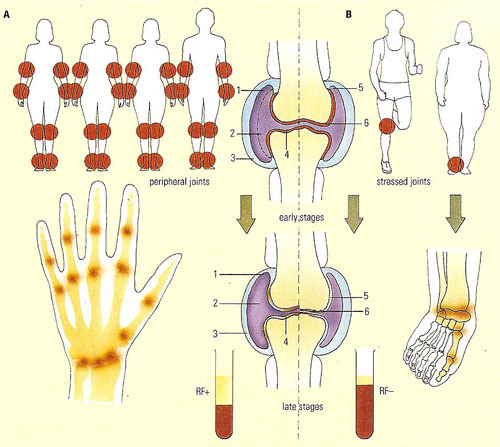 Peripheral joints, such as hands and feet, are most commonly affected. Blood tests show rheumatoid factor. Osteoarthritis (B), a degenerative disease, involves thinning of cartilage (5), loss of joint space (6), and bone damage (7). Heavily-used or weight bearing joints, such as knees and feet, are affected. Blood tests are normal. Arthritis is a disease that causes pain and stiffness in the body and problems in movement. Most kinds of arthritis cause pain and swelling in the joints. Joints are places where two bones meet, such as the elbow or knee. Over time, a swollen joint can become severely damaged. Some kinds of arthritis can also cause problems in the organs, such as the eyes or skin. One type of arthritis, osteoarthritis, is often related to aging or to an injury. Other types occur when the immune system, which normally protects the body from infection, attacks the body's own tissues. Rheumatoid arthritis is the most common form of this kind of arthritis. Juvenile rheumatoid arthritis is a form of the disease that happens in children.